This piece is based on first-person interviews conducted by the author that present a problem and the individuals working towards a solution. As policy students and practitioners, we often think of problems being solved by governments or by organizations such as foundations, charities or other NGOs. However, history has shown us time again that a small group of people can catalyze change. In post-colonial Togo, French remains the dominant language more than five decades after independence. “The teachers would tie a necklace of snail shells around your neck all day if you were caught speaking [a] mother tongue,” said Professor Kwadjo Dzidula Ehudoon Samla, a Togolese-born professor of linguistics at Ludwig-Maximilians-Universität in Munich, Germany. Though Togo has been independent since 1960, the language of the country’s former colonizer has remained the language of government and business. What’s more, local mother tongues in Togo, namely Ewe, Mina and Kabye, are sparsely recorded–only a handful of publications still print these languages. loss of vocabulary and fluency. Moreover, most government publications and newspapers are printed in French, with little use of local languages. According to Samla, Togo’s main 16-page newspaper features a one half-page of Ewe and one half-page of Mina. The result of this reality is two-fold: indigenous language, and ultimately the preservation of culture, is threatened; and for those not literate in French it means being left out of political and societal discussions happening in newspapers, government, or elsewhere. According to the CIA World Factbook, Togo’s average literacy rate is just over 60 per cent, but for women it’s about 48 per cent. “It’s a huge loss of the tradition, and in Togo it’s happening–the amount of people educated is small, and many people who have knowledge of the history don’t speak French,” said Bisila Bokoko, founder of the Bisila Bokoko African Literacy Project (BBALP). When asked why French has remained Togo’s official language Bokoko said this can be attributed to the fact that France’s presence at independence in 1960 was so widespread that it was not possible for the country to maintain its own identity and institutions. That link to the French language and to French institutions is still huge in Togo today, she said. With this in mind, efforts are underway by some members of the Togolese and West African Diaspora–including Samla and Bokoko–to better preserve, enhance, and celebrate their native languages. “Many African countries are still searching for identity,” she said, “[but] identity is being embraced, especially by the Diaspora.” African Diasporas are helping lead the charge for preservation of identity. Professor Samla has committed his professional life to language and identity. With experience and passion driving him, Samla developed a way to better record and enhance the use of one of Togo’s indigenous languages: Ewe. With a program for Microsoft Word, and through using UNICODE symbols, Samla adapted Ewe for digital use. He’s also developed and produced stickers that can be adhered to existing keyboards so that Ewe-speakers may type in their language. Samla can configure word processing programs to operate in Ewe, and plans to install these programs in Internet cafes and private schools. Six private Togolese schools have already agreed to cooperate with his project, and his university in Munich has agreed to equip these schools with computers. Prof. Samla uses Microsoft Word, adapted UNICODE symbols and keyboard stickers he created to allow Ewe-speakers to type in their language (PHOTO/MARGARET CAPPA). Without an adapted keyboard, Togolese who are literate type in Ewe or other local languages but use western keyboards and characters. As more Togolese become literate, it is the hope that they will be able to type and communicate in their mother tongues, and more publications will be printed in mother tongues. “To use this keyboard, you just have to install the software, stick on the stickers, and you have an Ewe keyboard,” said Samla. There are some hurdles to be resolved, he said, such as the fact that there are some words, such as ‘computer,’ that have no word in Ewe. 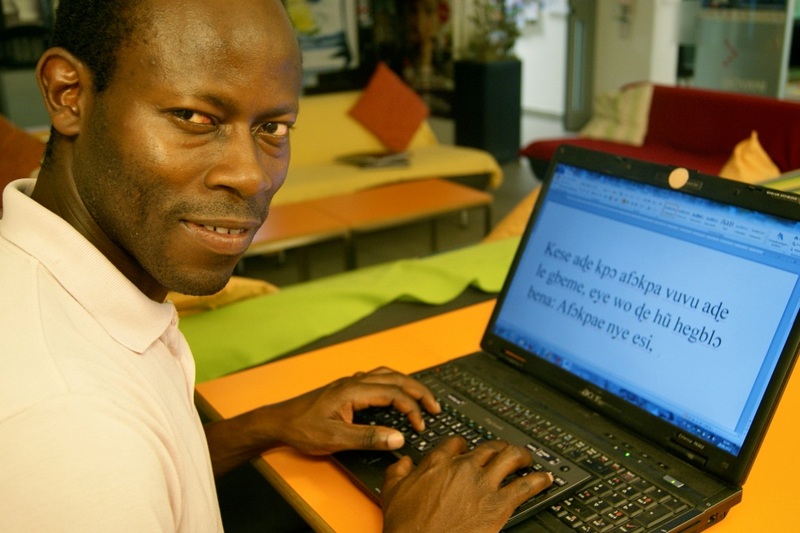 Like Samla, Bokoko works to preserve indigenous language in African countries. Her organization, the Bisila Bokoko African Literacy Project (BBALP) promotes literacy in Africa through building well-equipped, modern, and sustainable libraries, holding a collection of one or two thousand books. The libraries have a focus on books in local languages, and also include books in English, French, Arabic, and Spanish. Though Bokoko’s literacy project is not yet operational in Togo, she has plans to expand in the country once receiving buy-in from the government and local villages. A problem has been presented, and some driven individuals are trying to make a difference. Will they have the same effect as a wide-sweeping, government-funded national education program? It is possible, but of course they don’t have the means or capacity to fathom this in the first place. Perhaps you are thinking that Togo should first focus on improving its literacy rates, especially for women. Fair enough, though it is important to note that policy processes when driven by different actors from different purviews don’t happen in a linear fashion. And finally, what I learned while researching this story and from interviewing Professor Samla and Ms. Bokoko is that the efforts of a few passionate people making deliberate choices to improve the greater good in any community, region or nation should always be considered as integral pieces of the wider policy process. Margaret Cappa is currently an economist with the Province of Ontario. She graduated from the SPPG in 2012, where she served as Editor-in-Chief of the PPGR. Margaret has also worked as journalist in Canada, Arctic Norway, and Rwanda.